There was no room in the inn on the day of his birth. There was no room for my Saviour when he came to earth. 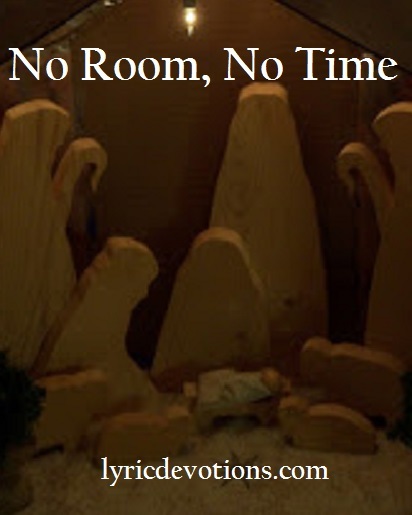 No room in the inn, on the day of his birth. No room for the Saviour come to earth. No time to listen to the Good News he brings. No time to hear of a Saviour and King. No room in man's heart for the gift that he gives. No room in man's heart for the Saviour that lives. No time to give heed to the warning call. No time for the Saviour, no time at all. Will you make room for one more guest? The one who comes to give you rest. and receive the greatest gift of all? will you even hear his still small voice. Make room in your life every day of the year. Make room for the Saviour to draw near. Take time to listen to the Good News he brings. Take time to hear of the Saviour and King. Make room in your heart for the gift that he gives. Give all of your heart to the Saviour that lives. Take time to give heed to the warning call. Take time before there is no time at all. Luke 5:32 I came not to call the righteousness, but sinners to repentance.